Essex County Hospital is my alma mater, the place that catapulted me from a shy, naïve young man into a registered nurse. It was where I learned about human nature, about human suffering, and how patients, families and staff respond when faced with accident, illness or death. The few years I worked there made a profound and lasting impression on me. Now, nearly five decades on, I still find myself thinking about my time there, reflecting on particular patients or staff, and how together they helped shape my later career as a nurse teacher and education manager. I left school with no qualifications, but somehow managed to squeeze into nurse training courtesy of the long defunct General Nursing Council entrance test. This was the era of hospital-run apprenticeship training, and Essex County Hospital generously gave me my first taste of paid work. Even though nominally we were “student” nurses, we thought of ourselves as workers, and were certainly used by hospital management as pairs of hands. Lengthy periods of time rostered on the wards and departments alternated with short “blocks” of formal teaching in the classrooms attached to the hospital. In those days – the late 1960s – university education was not even a speck on the horizon. We need to jump forward forty odd years to April 2014, when I learn that the Trust is planning to close Essex County Hospital seemingly with little fanfare. A few years earlier, a similar situation had arisen in connection with Severalls Hospital. I had also trained and worked there, in the 1970s, immediately after leaving Essex County Hospital. Severalls closed in 1997 and the buildings, but more importantly the lives and memories of patients and staff, allowed to slide into an unforgivably painful and tortuous period of decline. 1998 saw the publication of a Trust-commissioned social history of the hospital (“Madness in its Place” by Diana Gittins) which was well received by reviewers. But the profound and highly visible blight inflicted on the Severalls site had obliterated many of the more subtle benefits accrued from the Gittins’s book. By September 2012, when it appeared the developers were close to bringing in the bulldozers, I wrote an impassioned letter to the Chief Executive and Chairperson of the Mental Health Trust in which I argued for a final open day. These extracts convey the tone. I worked at Severalls between 1970 and 1983, as a student nurse, staff nurse, charge nurse, nurse tutor and finally senior tutor … My experiences in Severalls made a lasting impression … I witnessed the good, the bad, the cruel and the compassionate faces of mental health care. I tried in my work with students and colleagues to improve the care offered and to encourage respect for every individual. Overwhelmingly, I came away with a strong sense of the reality of people living out their lives, lives intertwined and complex, not always happy but equally not always sad or tragic. Whatever one believes about the suitability of large institutions like Severalls in the care of people with mental illness, the simple truth is that many people did spend large parts of their lives there – patients and staff – experiencing the heartaches and happiness shared by those in wider society. … I believe that many people, myself included, would appreciate the chance to visit the hospital before it is transformed into a different kind of community altogether, before the bulldozers begin in earnest. 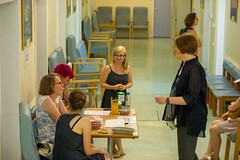 Arranging a visit for those people who would like to bid a final farewell would be a very fitting gesture of respect to everyone with connections to the hospital. I found your comments extremely interesting and also very moving. I am sure [the CEO] will respond to your suggestion of a “farewell” visit in due course. In the meantime, many thanks once again for taking the time and trouble to write to me. Although I was never rewarded with a reply from the CEO, the Trust did organise a “Farewell to Severalls” tour, which eventually took place on 7 November 2013. Everyone taking part in the tours received a ‘certificate’ to mark the occasion. Although the Trust worked hard to organise the day, I felt that an opportunity had been missed. No thought had been given to capturing the memories of those taking the tours. Spontaneous recollections on the day were reflective, rich in detail, and full of all shades of humour. Sadly, they went begging. In 2014, with the Severalls Hospital experience fresh in my mind, I felt compelled to respond in some way to the imminent demise of Essex County Hospital. 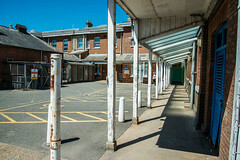 Whilst I fully understood that the Trust’s top priority had to be the smooth transfer of patient services from Essex County Hospital to Colchester General, I remained conscious of the fact that this was a hospital with a 200 year history, and I feared that this considerable legacy might not be recognised, or its role in the life of the local community not fully valued. So, on 14 November 2014, I emailed the then Chief Executive of the Trust – Dr. Lucy Moore – with my concerns. At that time I was in the throes of a PhD at the University of Essex which, although based in the Sociology department, had strong connections with History. Given my irrepressible urge to create links between people and ideas, I struck out in several directions, pressing the case for collaboration between the Trust, the university’s History department, and Colchester Recalled. The latter is the voluntary local history group founded nearly thirty years ago to compile an archive of recorded memories of Colchester and District over the past 120 years. To cut a long story short, by February 2015 Colchester Hospital NHS Trust had invited me to join a working group to plan an Essex County Hospital “open day” for the summer. Before long I had also secured the agreement of the History department for one of their staff – Dr. Amanda Wilkinson – to formally represent the university on the working group. Chaired by Nick Chatten (project manager for the transfer of services), and supported by his deputy Becci Hurst, the group steamed ahead. The open day was held on Saturday 13 June 2015 with local media providing valuable advance publicity. 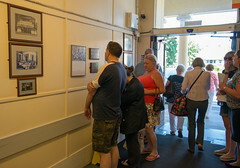 On the day, some 500 visitors arrived. 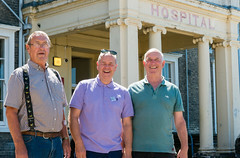 We escorted them in small groups on a tour of the hospital; volunteers from Colchester Recalled took the contact details of those willing to share their memories of the hospital. 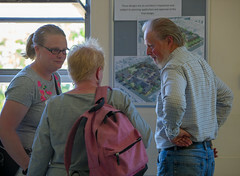 After the Open Day, Nick Chatten wrote a letter of thanks to all those who had helped to make the event such a success. I’ll quote from his letter because it conveys something of the impression the day made on the hospital management. I wanted to put on record my very sincere thanks to you for the part you played in making our ECH Open Day a great success. 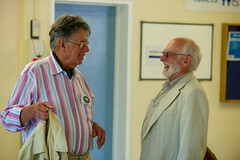 It was a real pleasure to overhear the chatter about times past and to see so many former colleagues meeting up. 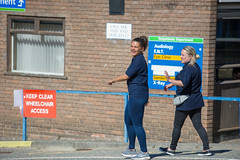 Whilst at times we were a little overwhelmed by the sheer numbers coming through the door, the whole ECH team of staff, past and present, rose to the occasion and gave visitors a very interesting and enjoyable visit. Since the open day, it is great to see that the ECH heritage project has really taken off, boosted by the appointment of Dr. Alix Green to the History department. Her special expertise in the promotion of public history and community engagement is exactly what the project needed to take it to the next level. Although the delay to the closure of the hospital (now expected to be July) must have frustrated hospital management, it had the beneficial side effect of providing extra breathing space for the heritage project to get off the ground. On a personal note, I “lost” several months of involvement with the project due to other commitments. However, now that I have resurfaced, I can recognise just how much progress has been made. I am particularly pleased to see that the connections between the various stakeholders have been strengthened, especially through the generous sponsorship of the two MA History students whose energy, expertise and commitment is reflected in this website. Terry began his health service career in 1967 as a student nurse at the Essex County Hospital, followed by psychiatric nurse training at Severalls Hospital. After qualifying as a Nurse Tutor in 1977, he spent six years in psychiatric nurse education at the North East Essex School of Nursing. In 1985, he moved into further and higher education at Colchester Institute. He left in 2003 to become an Education Consultant working freelance for local colleges, funding bodies and national education and training agencies. Terry has written two textbooks for the care sector, and articles for various professional journals and popular magazines. In 2013, he started a full time sociology degree at the University of Essex, graduating in 2017. His PhD thesis was entitled “Roots of Remembrance: Tracing the Memory Practices of the Children of Far East Prisoners of War”. His interest in local and public history has grown significantly in recent years, linked principally to the closures of Severalls and Essex County Hospitals. He has just been appointed a ‘Community Fellow’ by Essex University’s Department of History.